Hi everyone, Kat here. 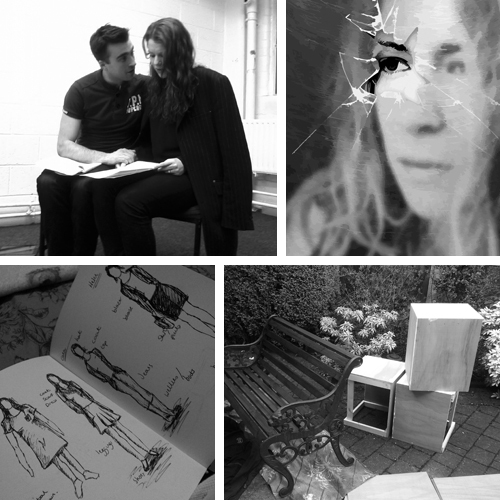 I’m the designer for Broken and A lot of it About for Organised Chaos Productions. I have only just recently graduated from LIPA, summer 2012, so am very excited and lucky to have been chosen to be part of this great theatre company! I’m really enjoying it so far. I have done some smaller tours previously, one with a puppet show that I designed and made, and another most recently with the brand new Theatre Company The Lion Tamers, on their show “In Pursuit of Oblivion” by Robert Pegg. So I wanted to expand my knowledge of touring productions and how different theatre companies work. I love the problem solving and logical thinking that’s involved. It has been a great opportunity to design both the shows, and a great challenge to think how we could possibly use the same items. So far, I have been visiting rehearsals, gathering costumes and props for the performances, and this weekend have started building the set, which is very exciting seeing it all come together! I can’t wait to see them both together at the dress rehearsal on Tuesday evening, and for the opening night at the Lowry on Thursday. Hope you can all make it, and that you enjoy the shows! To see the tour dates and book tickets for Broken and A Lot of it About, visit our website. This entry was posted in Introducing, Kathryn Allan, Set Designer and tagged a lot of it about, broken, broken & a lot of it about, kathryn allan, organised chaos productions on April 21, 2013 by sarahgracelogan.